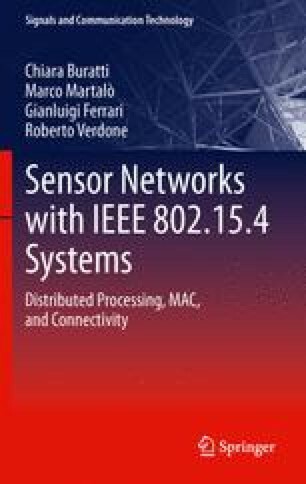 In this chapter, we analyze the problem of distributed detection of a spatially constant phenomenon in IEEE 802.15.4-based Wireless Sensor Networks (WSNs). We first present a communication-theoretic framework on distributed detection in clustered sensor networks with tree-based topologies and hierarchical multi-level fusion. The sensor nodes observe a binary phenomenon and transmit their own data to an Access Point (AP), possibly through intermediate Fusion Centers (FCs), which perform majority-like fusion strategies. Note that the AP functionality is concentrated in the Personal Area Network (PAN) coordinator and this notation is used to highlight the fact that the AP is the network collector. Moreover, the (FCs) correspond, according to an IEEE 802.15.4 notation, to Full Function Devices (FFDs), whereas the sensors are implemented through Reduced Function Devices (RFDs). We investigate the impact of uniform and non-uniform clustering on the system performance, evaluated in terms of probability of decision error on the phenomenon status at the AP. Our results show that, in the absence of inter-node interference (low traffic load), uniform clustering leads to minimum performance degradation, which depends only on the number of decision levels, rather than on the specific clustered topology.